Heat oven to 350°F. Lightly spray cookie sheet with Crisco® Original No-Stick Cooking Spray. In 3-quart saucepan, cook and stir 2 tablespoons of the butter, olive oil and onion over medium heat until onion is softened, about 3 minutes. Remove half of the onion with slotted spoon to small bowl; set aside to cool. To remaining onion in pan, stir in apple; cook an additional 3 minutes. Stir in curry powder, cinnamon, thyme, turmeric and celery salt; cook an additional minute, stirring constantly. Stir in soup and honey; bring to a boil. Reduce heat to low; simmer 10 minutes. Remove from heat. Meanwhile, to remaining onion, stir in cheese, cumin, salt and pepper; mix well. Remove dough from can; cut into 4 pieces. To make naan, roll each piece of dough into a ball. Flatten each ball slightly. Place 2 tablespoons of cheese mixture in center of each piece of dough; press into dough. Wrap dough around cheese and pinch dough to seal. On lightly floured work surface, roll each filled ball into 5-inch round. Place on cookie sheet. In small microwavable bowl, place remaining 2 tablespoons butter. Microwave on High 15 to 20 seconds or until melted. Brush both sides of rounds generously with butter. Bake 14 to 20 minutes or until bottoms are golden brown. Stir half-and-half into soup; heat an additional 2 minutes. 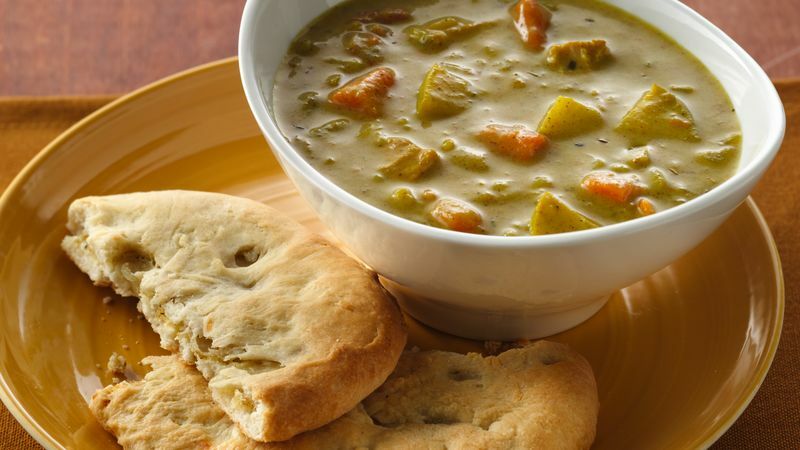 Serve soup with warm naan.